One of my favorite places to look in the forest is up. I love the way trees frame patches of sky, and how rays of sun slide over the branches and slant into pockets of darkness. On a recent stroll through the woods near Echo lake, I found myself, as usual, looking up. I saw mostly fir and birch trees, and I took their narrow trunks and modest heights as signs of a young forest. But it was a much older tree that caught my eye. 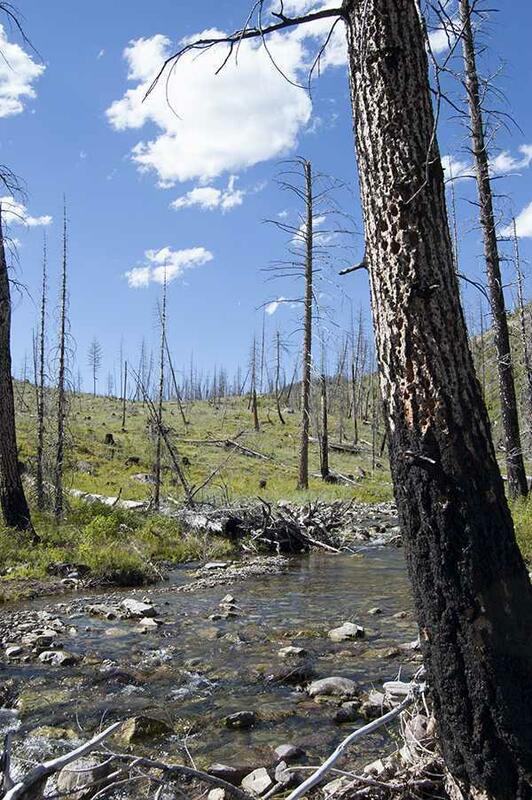 Burnt snags in western Montana. A hulking snag towered some 15 feet above the forest’s thin canopy, charred a uniform black from the ground all the way up to its sharp tip. There were few other signs of fire, and I figured this snag had probably burned years before the trees around it were even saplings. So the burnt snag was a survivor, one of the last remnants of a different forest that was now long gone. But I wondered, do snags actually serve a purpose? What creatures could possibly make use of this dark, uninviting carcass? Standing dead snags are indeed essential to the forest community. They are often centers of activity, providing several services to many forms of life. In some areas, up to 60 separate types of organisms have been observed to inhabit a single snag. Technically speaking, a snag is an upright section of a dead tree stem. They are at least six inches in diameter and over 20 feet high, but snags come in all sorts of shapes and sizes. Each snag is classified as hard or soft, which determines the plants and animals that will most likely be found inside. A hard snag is younger, burnt more recently, and may still have some bark and branches. A snag softens as it ages. In its most advanced stage it falls over and becomes a log, performing a different set of forest functions. While it remains standing, which can be decades, a single snag crawls with moss, lichens, fungi and invertebrates, as well as several birds, bats and mammals like flying squirrels and martens. The highest profile snag-users though may be cavity-nesters. As the name suggests, these are birds that take advantage of a snag's softening wood, and carve out little caves for themselves, or sometimes use already-existing hollows in a tree. Woodpeckers are an especially noisy type of cavity-nester, and are highly-adapted to using snags. They test each dead tree for hardness, boring into its wood and listening for a special resonance that indicates a soft core, and thus a potential home. The softer the tree, the easier the nesting, and tatttooed snags, pecked and rejected throughout the forest, suggest woodpeckers can be fairly choosy in their snag-selection process. But snags offer more than just a home for the cavity-nester. Both black-backed and three-toed woodpeckers seek out burnt snags for both shelter and food. Many cavity nesters eat mostly beetles and larvae, which are found under burned bark. Think of the snag as a one-stop shop for forest creatures. What's more, the beetles depend on snags, too. Many types thrive on nutrients under snag bark, and even have special skills to find burnt trees. Melanophila beetles, for example, have infrared sensors that can detect charred groups of trees from up to 100 miles away. And that's not all. Other birds, such as flycatchers, swallows and owls use snags as hunting launch pads. They scope out their prey from above, enjoying the snag's high, often hidden perch. And mammals, including flying squirrels and American martens use snags as hideouts and rest spots. So next time you're in the forest, pause for a moment at the foot of an old snag. Maybe you'll hear the tap-tap-tap of a woodpecker's beak, echoing through a quiet forest, or be lucky enough to glimpse an owl tucked into a rotting tree trunk. Perhaps you'll let your eyes wander up its trunk, and you'll appreciate, as I did, how the great snag grabs your gaze, pulls it up, and throws it straight at the sky. When I feel the need to escape from town and immerse myself in the woods, I head up to Marshall Canyon, just east of Missoula, for a hike. Hiking along one of the old roads through the woods and taking in the fresh air and the views down the Clark Fork River towards Milltown soothe my soul and put things back into perspective. As I hike, I frequently hear what sounds like the squeak of a playground swing, swinging back and forth. This sound, however, is completely natural, the call of a somewhat drab-looking bird: a Townsend’s Solitaire. As winter comes to the national wildlife refuges of the Mission Valley, we begin to see a whole different group of visitors. And I’m not just referring to the human kind. Strange as it may seem, the National Bison Range, Ninepipes National Wildlife Refuge and Pablo National Wildlife Refuge, along with other lands in the Mission Valley, are where a number of birds choose to spend their winter. Afternoon sunshine was softening into twilight on a recent fall day as I drove with my family down a forest road in the mountains north of Missoula. We were heading home after a day of hiking and grouse hunting—and we had a blue grouse to roast for dinner. We rounded a bend to find a covey of seven ruffed grouse, milling about in the road and pecking at the gravelly surface. What were they doing? Break off a sprig of big sagebrush and inhale its aroma: the fragrance is clean, sharp and as cool as the smell of winter. Call it camphor blended with a touch of Christmas. Crush a few leaves between your fingertips and the scent is suddenly somewhat bitter and more pungent. Let the sprig dry for a few hours and you’ll find that the fragrance gradually loses its bite, softening to crisp evergreen with a hint of juicy berry.